Induction heating is a non-contact method of heating electrically conductive objects in a coil of wire carrying a high current alternating current. 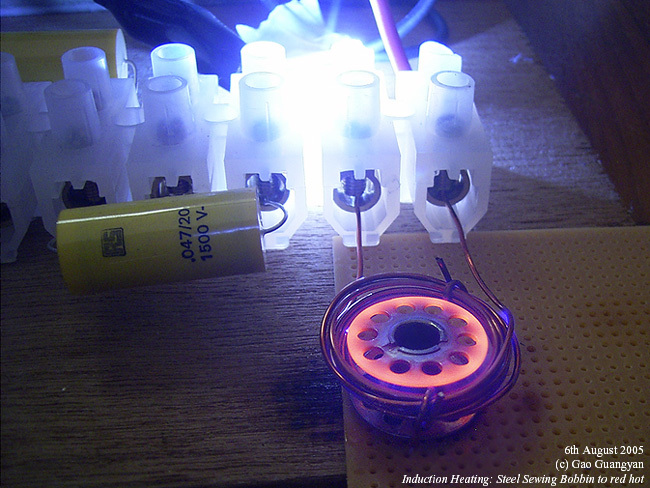 Using induction heating, an object can be heated without any physical contact with anything. Since this process is non-contact, the heating method does not contaminate the material being heating, and is also efficient as the heat is generated in the object. This method of heating has been used in industrial processes such as shrink-fitting, metal forming, alloying and tempering. This process can also be used for eliminating oxygen in vacuum tubes and for high volume industrial welding. This flameless heating technology has also been adopted into the home kitchen in the form of an induction cooker. The basic operating principle is as follows. A high current, high frequency alternating current in a coil of wire creates a strong rapidly alternating magnetic field. This strong changing magnetic field will induce huge eddy currents into a conductive object placed in its vicinity of the magnetic field and due to resistive losses in the object, it causes the object to be heated. In addition, due to the high frequency used in induction heating, a phenomenon called the skin effect takes place. The skin effects causes the currents to flow in a thin layer at the surface of the object, increasing the effective resistance of the material and therefore increases the heating effect. For magnetic materials such as iron, there is an additional heating effect. The rapidly alternating magnetic field changes the polarity of the magnetic object rapidly. The rapid flipping of the magnetic domains in the magnetic material causes an additional heating effect... Hysteresis losses. For this reason, magnetic materials tend to be easier to heat than non-magnetic materials. Interestingly enough, many magnetic materials like steel loses its magnetic properties at its Curie temperature, which is about 700C for steel. That means above the Curie temperature, there cannot be heating due to hystersis losses. 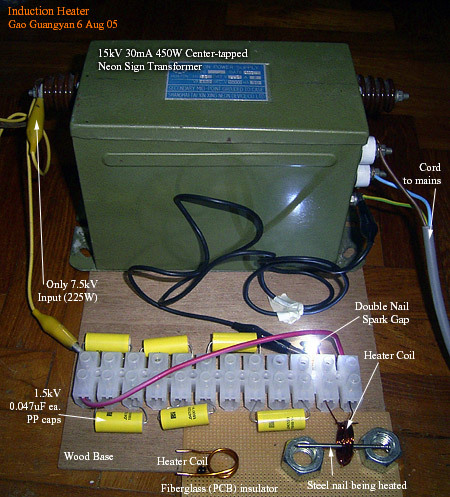 This page outlines a simple induction heater created by loneoceans labs to investigate the effects of induction heating. Above you can see my first attempt of a very simple spark-gap switched induction heater. This heater is built using left-over materials and is therefore not optimized in anyway, but should be able to demonstrate the effects of induction heating. The high current high frequency alternating current is created using a spark gap switched RLC circuit which is similar to a Tesla Coil. 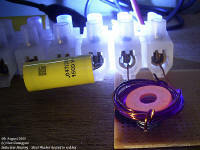 For the main power source, I used a center-tapped 15kV 30mA Neon Sign Transformer; but I only connected half of it to get 7.5kV at 30mA or 225W of power. This is connected to a capacitor bank made up of 6 1.5kV 0.047uF polypropylene film foil capacitors in series (leftovers from my tesla coil 1 project). Everything is connected using one big wire connector. Switching is done via a simple spark gap made out of two steel. nails. heating coils are made out of magnet copper wire. The setup is placed on a plywood base and to insulate the material being heated and the base/floor, a surplus PCB board (fiberglass) was used. The system performed properly though not very efficiently. However, it was still able to heat several objects to red hot (est. 700C). 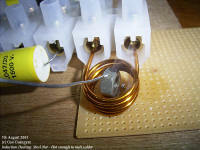 Photo 1 shows the induction heater heating a steel nut. It got hot enough to melt solder in just a few seconds. I change the work coil to something with more turns and it managed to heat a steel sewing bobbin to red hot in around half a minute (2nd photo). In the 3rd photo, you can see a steel washer being heated to red hot. It is balancing on top of a steel wire spring. 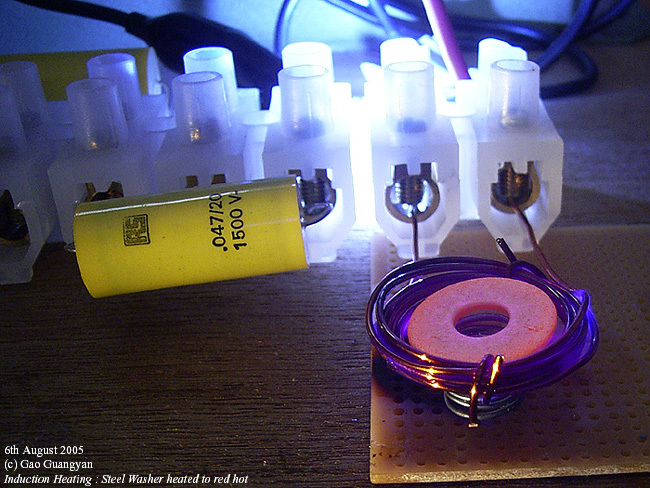 The purple glow you see around the wire coil is due to the high voltage ionizing the air causing corona.